The SoundTouch 300 is a beautifully made, precise sounding soundbar. But only those with an HDMI ARC-equipped TV should apply. When the Bose SoundTouch came out in 2016, the world was a very different place. Sure, Sonos had developed its spectacular Sonos Playbar and Samsung began its path to aural dominance with the Samsung HW-MS650 - but, by and large, the soundbar space was owned by Bose. These days, however, Bose isn't the driving force in soundbars that it once was and while that's disappointing in some respects, at least it went out on a high note: Boasting high-end design, this slim soundbar looks superb, and sounds above average. It's limited by a single HDMI-out but the SoundTouch 300 does enough to justify its position as a premium soundbar offering, with a broad, dynamic and articulate performance with both music and movies. ...it also doesn't hurt that you can pick up the SoundTouch 300 these days for around $200/£200 less than when it first came out. Need a wireless soundbar with plenty of sound and not a ton of HDMI ports? The Bose SoundTouch 300 has phenomenal sound, articulate performance and can customize its sound to your space. With £200 off its regular price, it's a brilliant buy. Build quality is commensurate with the price. Bose’s flagship bar sports a tempered black glass top plate (which admittedly is a bit of a fingerprint magnet) complemented by a wraparound aluminium grille. It's also worth mentioning that, as this isn’t a 2.1 package, there’s no subwoofer supplied, although Bose will sell you a wireless Acoustimas sub for an additional $700/£600. Turn it upside down and the base of the bar has two non-slip rubber pads. Connections, recessed at the back, comprise an HDMI with ARC (Audio Return Channel), plus HDMI loop-through, optical digital audio input, Ethernet, Acoustimas jack, Adaptiq microphone input and micro USB connection. HDMIs are v2.0 and support 4K HDCP 2.2 sources, such as Sky Q 4K or the Roku 4. There’s not much room to maneuver back there though and things do get a little fiddly when you try and lace the thing up. The ST300 comes with a large, generic Bose remote, complicated by buttons for features not on the ST300 at all (DVR, Channel +/-). Key to the initial setup is the Acoustiq room calibration system, which tunes the output to your listening room. It's similar to the Audyssey and YPAO systems seen on AV receivers. However, while they tend to come with small standalone microphones which awkwardly need to be positioned at listening height (Denon and Marantz helpfully include a cardboard tripod with their receivers), the Bose mic is built into a plastic headband. This rather brilliantly allows the ST300 to measure at exactly the right listening height. Inevitably, there’s also a SoundTouch app (available for iOS and Android). This is designed for music streaming (services and NAS) from a smartphone, rather than full system control. It does offer presets, however, which can be assigned to different sources. Don’t think you have to download the app, though. It’s easy enough to wirelessly stream over Bluetooth (there’s quick touch NFC for those with compatible smartphones) or use Spotify Connect. That said, connecting the ST300 via HDMI over ARC is the recommended way to use the bar. The SoundTouch will seamlessly relay whatever audio is being output from the TV, while that HDMI loopthrough accommodates another source not directly connected to the TV (just select the HDMI ARC input to view). Things get rather more convoluted if you opt for an optical audio input instead (if your TV does not support ARC). We tried setting the ST300 up using just such a TV and could get nothing out of the ST300 at all. We’ve set up numerous soundbars and soundbases this way, but the Bose was having none of it. After several hours of getting perplexed and vexed we gave up. Frankly, if your TV doesn’t support HDMI with ARC, you’re better off looking elsewhere. Get there in the end, though, and performance is sweet; there’s an awful lot to like about the ST300. It does an excellent job with dialogue, keeping centre-placed vocals crisp and clear. On the flip side of that, some content dialogue can sound a little sharp, but at least there’s no trace of sibilance. While the soundbar doesn’t create any faux surround, it does paint an extremely wide and atmospheric soundscape. This proves particularly effective with live sports – coverage of Anthony Joshua’s heavyweight title defense really did place me in the Manchester Arena. This immersive presentation works well on movies, too. When Watney drives across the Martian surface listening to Donna Summer's Hot Stuff (The Martian), there's just the right amount of club ambience in his futuristic dune buggy. That said, dispersion is tuned for the horizontal plane. The ST300 doesn’t image (sonically) as high as it does wide. For the best integration, try and ensure the soundbar sits close to the screen – Bose sells an optional wall-mount, if required. If you do want a full surround sound system, the ST300 can be partnered with the brand’s Virtually Invisible (i.e. small at 10cm) 300 surround speakers (priced at £250 a pair). The system is also compatible with the Bose SoundTouch wireless multiroom system which includes smaller Bluetooth speakers. One area where soundbars typically tend to lose out to multiple enclosure sound systems is unpicking complicated soundtracks. But the ST300 fares well in this regard. During The First Order Stormtrooper raid which opens Star Wars The Force Awakens, the clumping landers and resulting firefight finds room to breathe amid John William's symphonic score. Strings and brass sit back and away from the action. While the SoundTouch doesn’t do deep bass, we never really felt the absence of a sub-woofer. Poe Dameron's X-Wing is disabled with a satisfyingly visceral ka-blam. Musically, the ST300 holds its own. The Hans Zimmer/Junkie XL Wonder Woman Theme (from the Batman Vs Superman soundtrack) has a deep, triumphant riff that’s delivered with gusto. On the debit side, there’s no display beyond some mode LEDs, so you really have no idea where you are in terms of volume or modes. 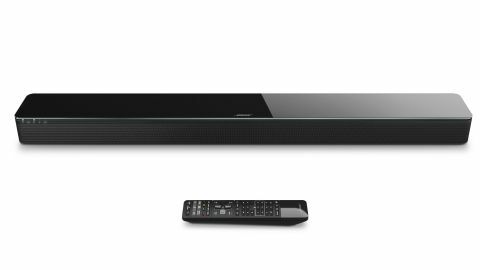 Boasting high-end design, this slim soundbar looks superb, and sounds above average. At 97.9cm wide, it’s best partnered with larger screen sizes (50-inch+) and this width also has the benefit of creating a convincing stereo spread. Plus, 4K HDMI support means you’ll have no problems connecting next-gen AV components and should theoretically give the SoundTouch a long lifespan. If you’re not the owner of a TV with HDMI ARC support, just don’t bother. And with only one HDMI loopthrough input, there’s not much room for system expansion either. The ST300 doesn’t do deep bass, and that optional sub is a costly investment. If you’ve already bought into Bose’s SoundTouch multiroom system, and have an HDMI ARC-enabled TV, then the SoundTouch 300 would seem a no brainer. It’s an impressive performer, capable of wide, detailed audio (although those hoping for gut-rumbling LFE will be disappointed). There are caveats regarding usability and price, but overall it warrants a cautious two thumbs up.